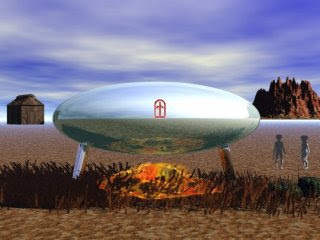 Latest UFO sightings – Egg-shaped metallic object photographed over Roswell, New Mexico on 13th February 2010 at about 5:30 pm. Is this sighting linked to Lonnie Zamora case which also happened in New Mexico in April 1964? I was walking along Main Road, Roswell, on my way to find some dinner. I was walking in the direction away from the heart of Roswell. At approximately 5.30pm I saw an object travelling through the sky which at first I thought to be a balloon. It seemed to be as small or maybe a touch bigger than a ballon but as it came nearer I noticed it was not a balloon. It appeared greyish/metallic/aluminum in colour and travelled at a good speed in a straight line though with a bobbing/rocking motion. I took two photographs with my camera on full zoom. The camera is a Canon PowerShot S200. I could only take two quick snaps as my battery had died and I did not have a charger. LUS 2010 – Most recent UFO sightings. LUS2010 new UFO footage. ovni. Join our site on Facebook! this photo is realy interesting. even Erich von Däniken wrote 50 years back that the best shape for travel thru space is egg or ball! on 5 may 2011 my friend and i were on my way to alton towers staffordshire england when i saw and egg shaped very shining id say shinig like a mirror object in the sky which suddenly just disappeared. Fall of 2007 around begining of Oct looking south on rout 10 headed east the time was between 3;00 and 5:00 pm. Nearing the continal divied in Mexico.